Marriage is a single moment in the life of a person, marking a new beginning for years. In India, weddings are a source of great celebrations. Sometimes it lasts about weeks also. Special arrangements need to be done for doing a perfect Royal Wedding in a real way. Royal weddings need the floral decorations as well as lightening in a grand way. City Palace is one of the most famous Palace, which lies in the heart of the Pink City. This palace is a blend of Rajasthani as well as Mughal architecture. The different Mahals in this palace are decorated with pillars, grills etc. Mughal Style is shown on the gates and walls of the Palace which contains lattice and mirrors in them which adds more beauty to the palace. In City Palace special arrangements are done in order to fufill the needs of the people who are booking the halls for the wedding. In fact, it is one of the ‘hot spots’, when it comes to the Royal Weddings. Royal Wedding in City Palace is popular with the Indians as well as the foreigners. Royal wedding in City Palace is a glamorous affair with beautiful architecture and culture which is spread all over. Shannai Waadan is also one of the major things which must be included in royal Wedding. Royal Wedding includes ring ceremony, mehandi rasams, baarat procession, jai mala, reception of baarat, banquet, lagna mandap for fere as well as vidai. The cultural dance programs are also arranged to entertain the guests. To make the wedding ceremony in Royal ways many couples come here for their wedding. 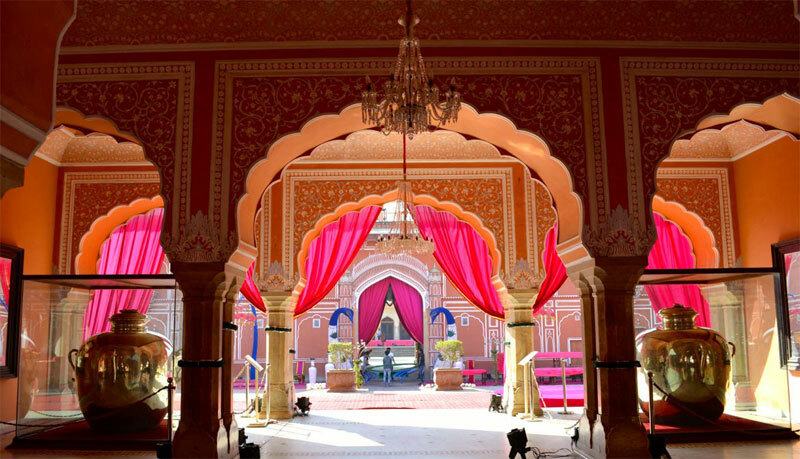 Getting married in City Palace recreates royal magnificence and provides regal experience which lasts forever.